Rest assured, God didn’t make anything simple in our body. A human hair is so complex that man will never fully understand it, much less explain its origin by chance evolutionary processes. Hair is mentioned over 100 times in the Bible, often in the context of God’s loving care and protection for His people. 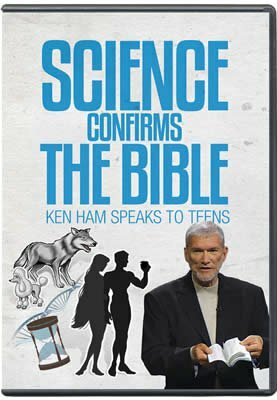 For example, when God delivered Shadrach, Meshach, and Abednego from the fiery furnace, “the hair of their head was not singed” ( Daniel 3:27 , KJV). In Luke 21:18 , Jesus warned His disciples of persecution but told them not to fear because “not a hair of your head shall be lost.” Finally, Jesus declared that even “the very hairs of your head are all numbered” ( Matthew 10:30 , KJV). How personally and intimately our Savior knows and loves us! The human head has an estimated 100,000 hairs, though the number varies from individual to individual. While hair appears to be largely confined to our head and a few other scattered locations, it is actually rather uniformly distributed over all our skin (with the exception of our palms and soles, which are truly hairless). On the entire surface of the human body, there are about 5 million hairs; but many of them are difficult to see. While some areas of our skin appear to lack hair (e.g., on the forehead and nose), they actually have tiny, colorless hairs called vellus hairs. We have about as many hairs per square inch on our nose and forehead as we do on the top of our head—we just don’t notice them. The long and often pigmented hairs (e.g., those of our scalp or beard) are called terminal hairs. Several other types of hair, such as eyelashes, form during the course of our life. The first hair follicles begin to form by the third month in the womb. 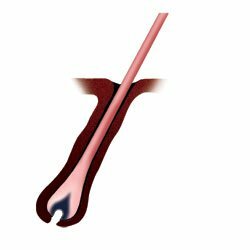 The follicles produce lanugo hair. 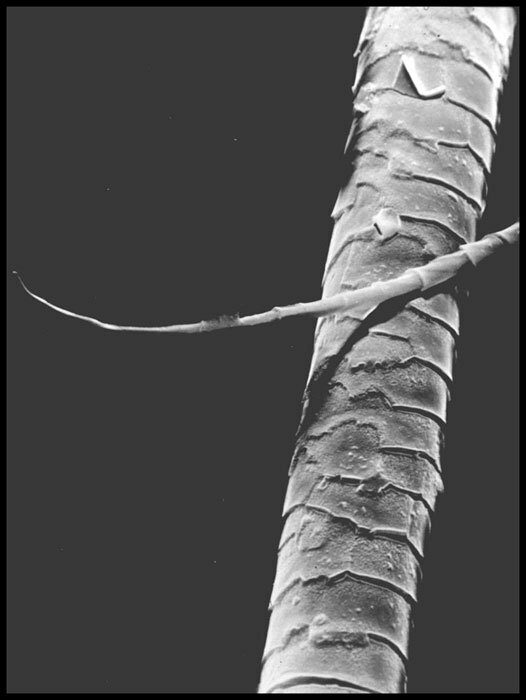 These rather long, silky hairs are usually shed in the womb a few weeks prior to birth and are replaced with vellus hairs, which grow out of the same hair follicles. 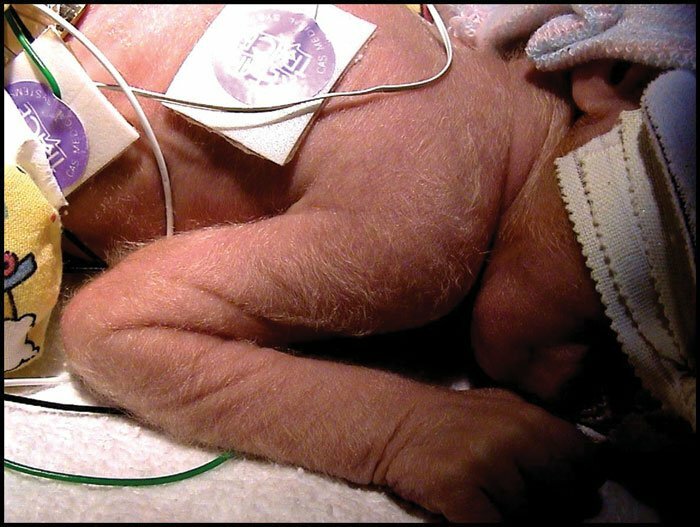 A premature baby may appear surprisingly hairy because of unshed lanugo hair. Amazingly, we are born with all the hair follicles we are ever going to have, and these follicles normally continue to produce hairs throughout our lives. Why then do so many of us get bald with age? Beginning at puberty, some follicles that had been producing terminal hairs begin to replace them with almost invisible vellus hairs. So you don’t lose hairs as you age, your hair just gets smaller. Why Don’t Animals Need a Barber? While many of us make periodic trips to the barber, most nonhuman mammals always appear in perfect trim without a barber. The reason for this is that hair grows in a cyclic manner. 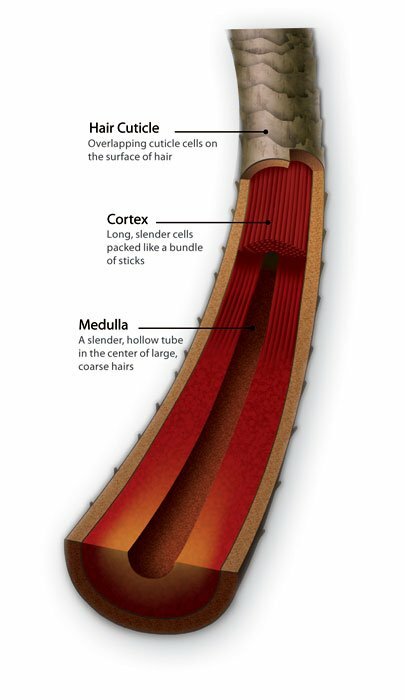 A relatively long period of growth (that varies with the type and location of the hair) is followed by a short period of rest after which the hair is released from the follicle, and a new growth cycle begins forming a new hair (see The Growth of Human Hair below). Thus the length of the growth cycle determines the length of the hair. If hair grew longer and longer without being released from the follicle, it would be disastrous for the mammals that don’t visit a barber. Can you imagine, for example, a squirrel dashing through the branches, dragging a couple feet of hair? The Lord thinks of everything! Hair grows about .3 mm per day (about three tenths the thickness of a dime). Within a year, our scalp and beard can produce nearly five inches (13 cm). By comparison, the longest hairs on our arm have a growth cycle of less than two months. The growth cycle of scalp and beard hairs varies from individual to individual but can be several years. A Vietnamese man was reported to have the longest scalp hair, which measured over 20 ft. (6 m) long. According to a BBC News report in June 2004, he claimed not to have cut his hair in more than 30 years. We stand in awe of Christ our Creator, who has lavished such exquisite design and complexity on even the hairs of our body. We are greatly comforted by Christ our Protector, who has numbered the very hairs of our head and will not permit one hair to be harmed if it is not His will. And finally, we are eternally grateful for the amazing grace of Christ our Savior who allowed His own hairs to be plucked from His cheeks as He endured taunting, torment, and death for our sins. “I gave my back to the smiters, and my cheeks to them that plucked off the hair: I hid not my face from shame and spitting” ( Isaiah 50:6 , KJV). Hair grows from the bottom of the follicle at a rate of 3 tenths the thickness of a dime per day. Hair grows to a certain length specific to each follicle then stops growing for a short period of time. When growth begins again in the hair follicle, the resting hair is released from the follicle and a new hair is produced. All hairs are covered with a layer of flattened dead cells (called the cuticle) that help to keep the hair from knotting up (imagine the knotted mess if our hair was made from comparably thin nylon thread). Under the microscope the cuticle looks like overlapping shingles or roof tiles. Wigs made from natural human hair must have all their hairs facing in the proper direction (the free edges of the cuticle cells facing away from the scalp), if they are to be groomed and lie properly. The shape of the cuticle has an added benefit—perhaps its most important function—it locks the hair in its follicle. 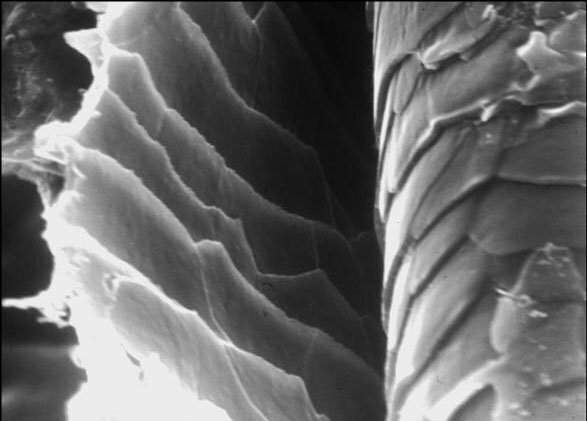 (Top Left) Magnified view of a human hair showing both mid-shaft and tip. The hair is covered with a layer of overlapping shingle-like cells called the cuticle. The hair needs to be locked inside the hair follicle to prevent it from being easily pulled out. Without a “hair lock,” hair loss would likely prove fatal for most mammals. 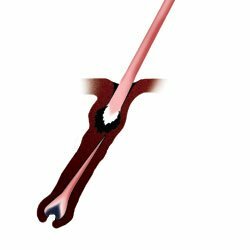 The hair follicle is lined with a cuticle whose overlapping cells face the opposite direction of the cuticle on the hair shaft. 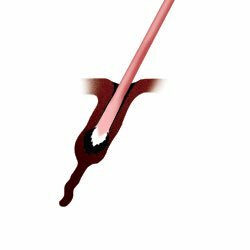 The precise interlock of the two cuticles makes it impossible to pull out a hair without tearing out a large part of the follicle with it. But don’t worry; this event immediately triggers the rebuilding of the damaged follicle and a new hair growth cycle. 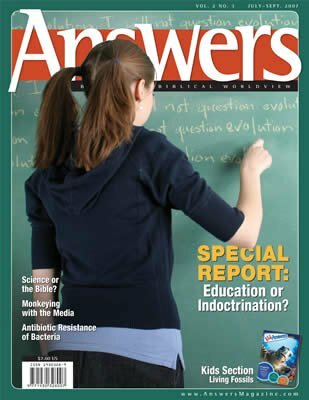 The question arises, if the hair is locked in place, how does it slide out as it grows? Amazingly, tens of thousands of little “buttons,” called desmosomes, line the hair follicle. These buttons are quickly buttoned and unbuttoned in a precise sequence to allow the hair to slide out in a controlled fashion. Before the hair emerges from the surface of the skin, the lock (the cuticle lining the hair follicle) is digested with special enzymes. 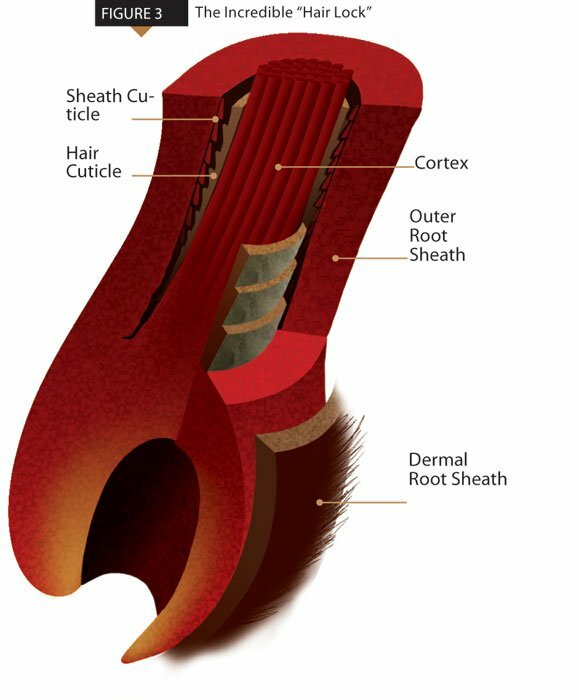 Cuticle cells, lining the innermost layer of the hair follicle, interlock with the cuticle on the hair shaft. 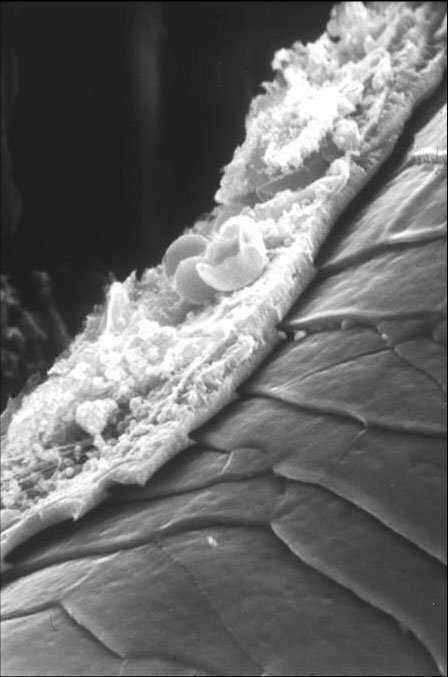 On the left is a magnified view of the follicle cuticle in contact with the hair cuticle. Below is a magnified view of the follicle cuticle peeled away from the hair showing a perfect match.